In this issue: In this issue: A trend article on the use of artificial intelligence by financial institutions to deliver greater value and to transform the customer journey. A case study on Ping An Bank and the transformation of its retail banking business through technological innovation and the optimisation of its organizational structure. An interview with Reuben Lai, senior managing director of Grab, regarding the impact of Grab’s cross-border e-wallet on the payments ecosystem and the promotion of financial inclusion across ASEAN. A country profile on Malaysia, which sees moderate loan growth against the backdrop of an increased adoption of alternative payment methods. Industry data following the varying strategic approaches adopted by banks when engaging with financial technology companies. 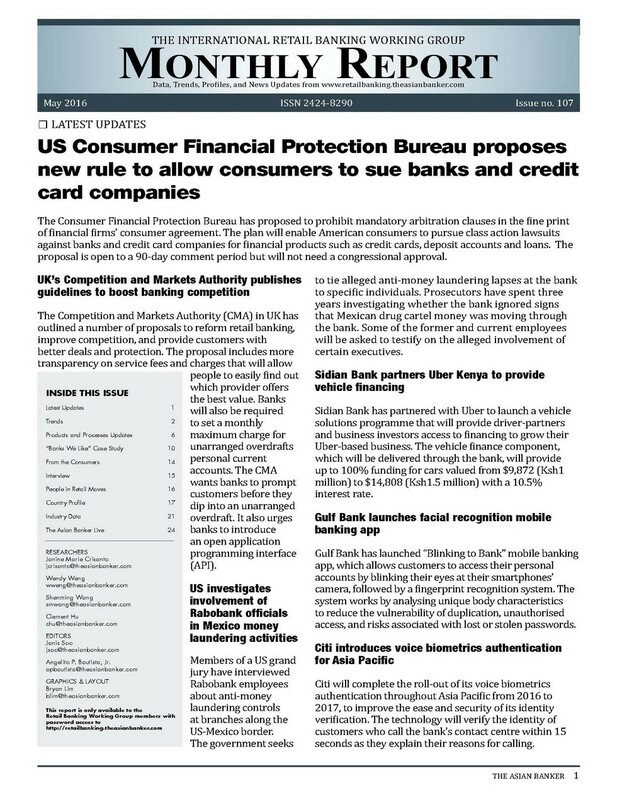 In this issue: In this issue: A trend article on the enhancement of digital services and the use of AI by financial institutions to improve the customer experience, particularly for customer onboarding. A case study on Yirendai and how it leverages technology and data analytics to provide a differentiated offering. An interview with Marnie Baker, managing director of Bendigo and Adelaide Bank, on the transition of Bendigo’s banking model, with regards to the digitisation and scaling up of the bank’s community banking model. A country profile on Thailand, following the rapid growth in mobile payments and the growth in retail lending. 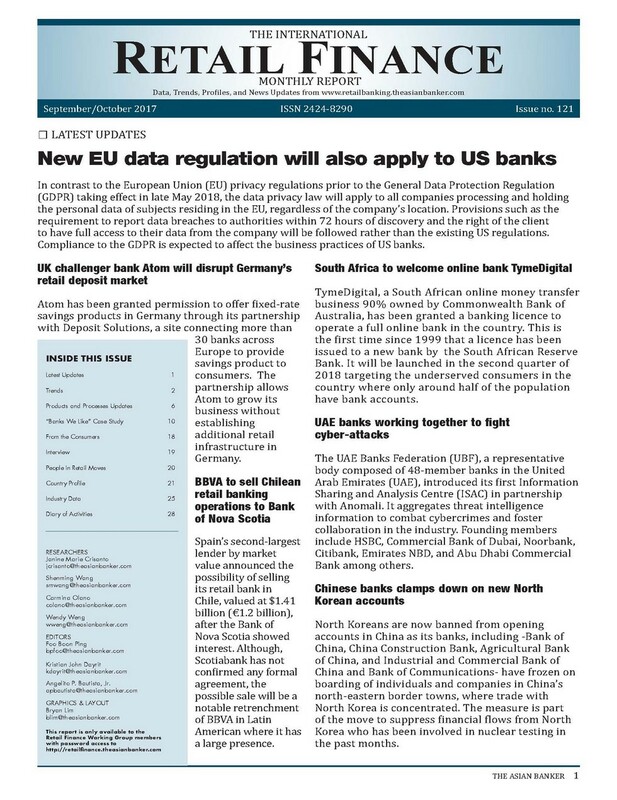 Industry data following the competition between commercial banks, and neo banks or digital financial institutions for digital users. 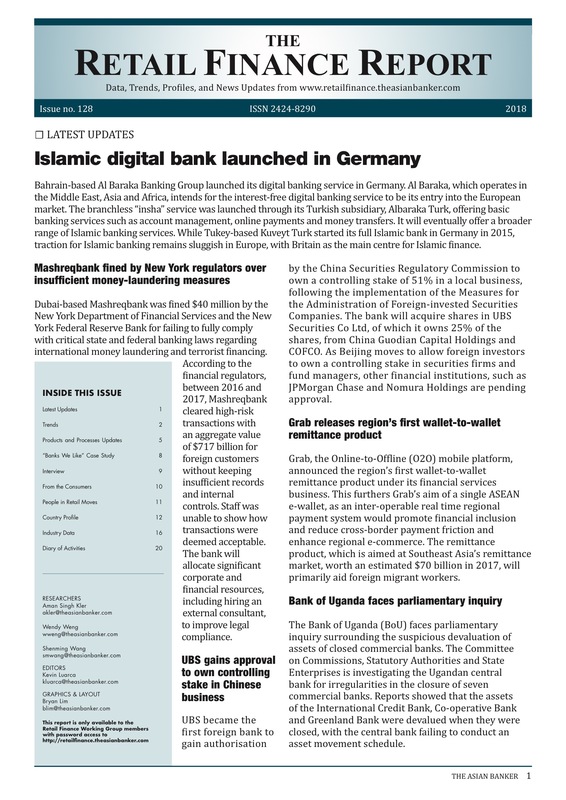 In this issue: In this issue: A trend article on the digital transformation journey of financial institutions and the issues and practices in ensuring a successful digital transformation. A case study on JD Finance and its shift from serving customers to serving financial institutions by leveraging its accumulated data and technology. 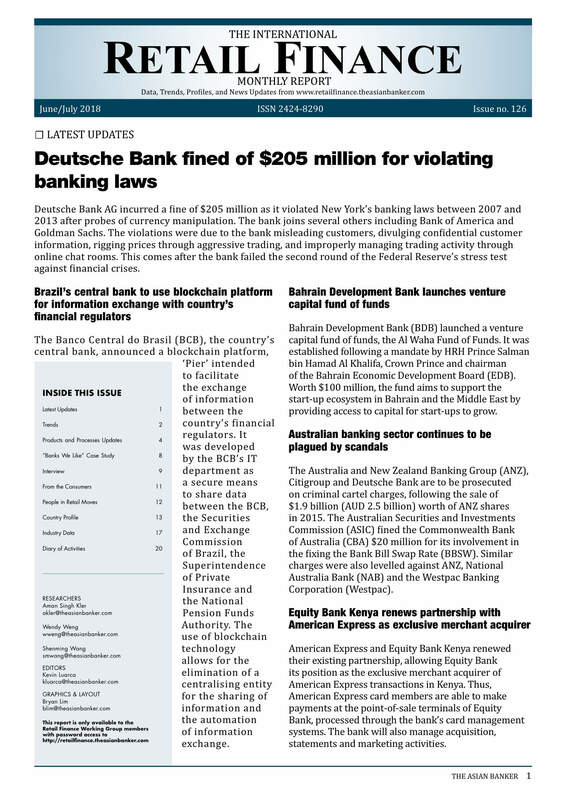 An interview with Paul Heath, the founding partner and Chief Executive Officer of Koda Capital, on the scandals plaguing the Australian banking sector, surrounding the misconduct of the wealth management businesses of several major banks. A country profile on India, tracking the slowdown of retail banking revenue growth. Industry data tracking the most competitive commercial banks that have actively shaped their digital ecosystem from within the organisation as well as the markets they operate in, based on the annual ranking of top retail banks for The Asian Banker International Excellence in Retail Financial Services programme. 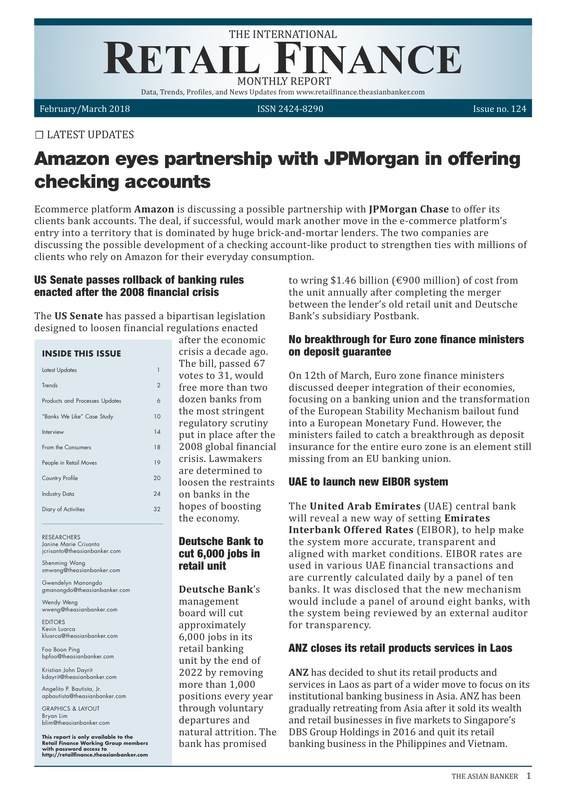 In this issue: In this issue: A trend article on how financial institutions are adopting opening banking strategies and creating API-enabled IT architectures. A case study on DBS applying the new digital banking model of Digibank to hasten the implementation of digital banking in the region. An interview with Henry Ma, Chief Information Officer of WeBank, a digital micro lender of Tencent Financial Technologies that applies blockchain technology to its microloan business as it aims to offer its platform as a service. A country profile on China, mapping the growth of retail banking income. Industry data covering tracking financial technology as a driver of the retail financial space in 2018, based on the annual ranking of top retail banks for The Asian Banker International Excellence in Retail Financial Services programme. 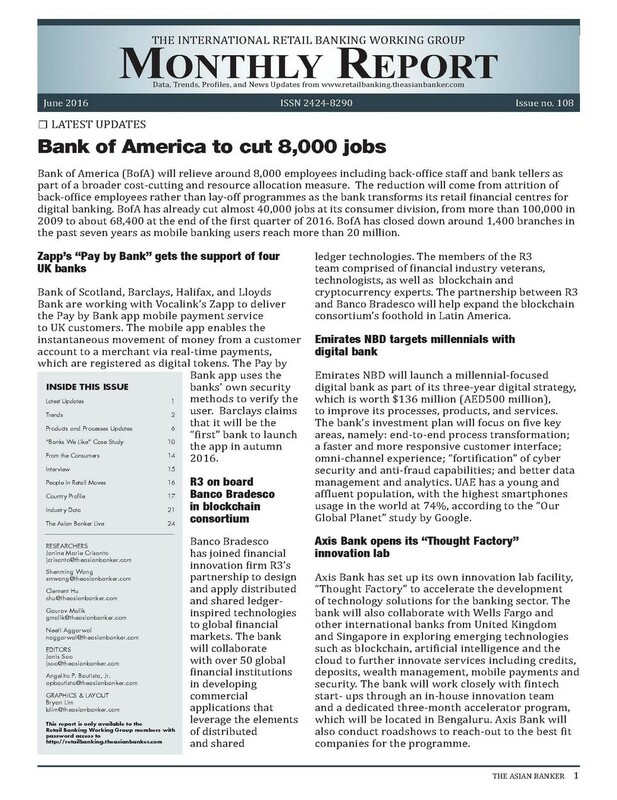 In this issue: In this issue: Trends article on a voice-led future and banking with "Alexa" and similar services; a case study on the success of South Korea's Kakaobank; and interviews with Simon Loong, CEO, WeLab; Cheng Li, CTO, Ant Financial; Grace Yin, director, WeChat Pay; and Madhivanan Balakrishnan, chief technology and digital officer, ICICI Bank. 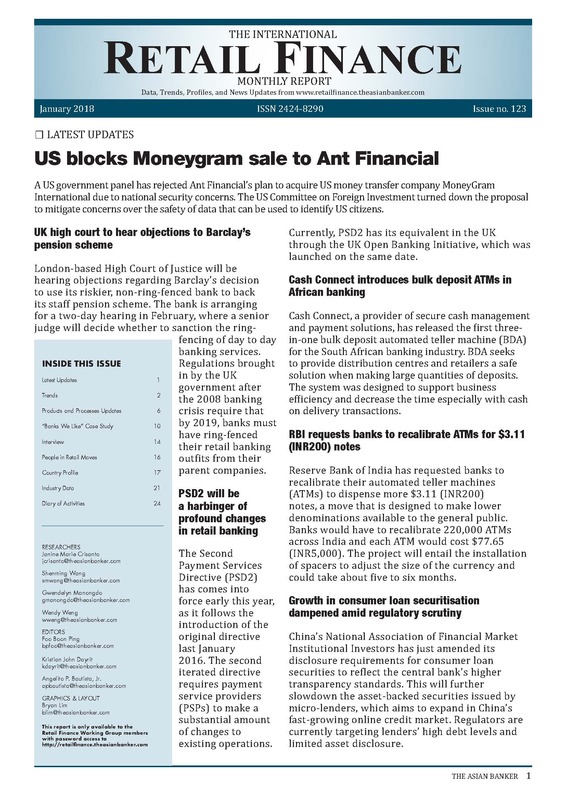 We also focused on a profile of retail financial services in Hong Kong; and industry data on mobile wallets and mortgages. In this issue: In this issue: Trend articles on how tech giants such as Amazon, Facebook. 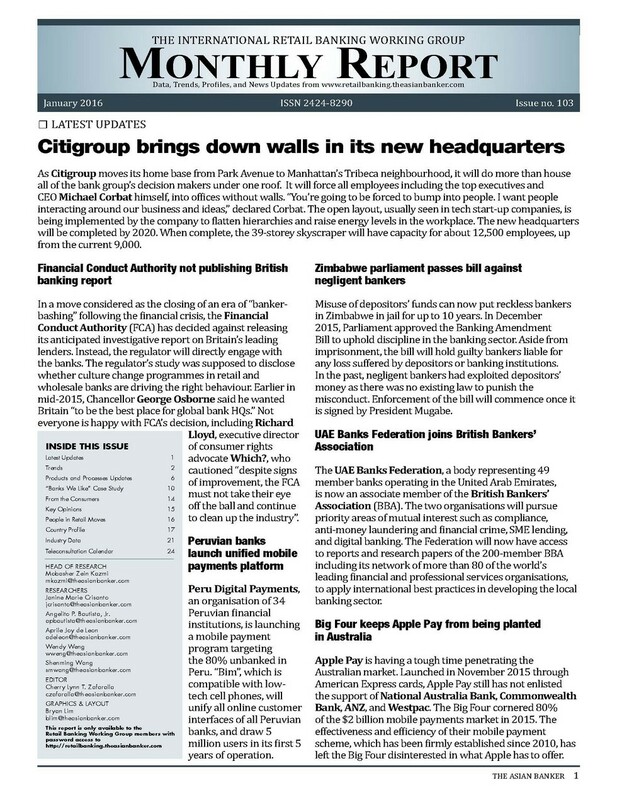 and Google are becoming looming threat to banks. Case study on how Funding Societies (Singapore) is leveraging on technology to create a sustainable P2P lending platform. Interview with Catherine Flax, chief executive officer of Pefin (US), a financial advisory firm that has built an enterprise wide artificial intelligence (AI) platform in the last six years. 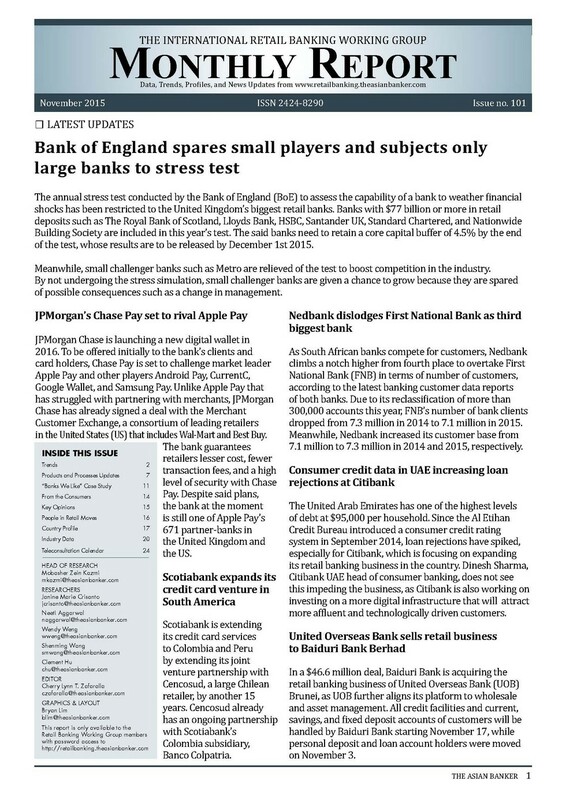 A country profile on Thailand banks as they are preparing for the next phase in digital competition. 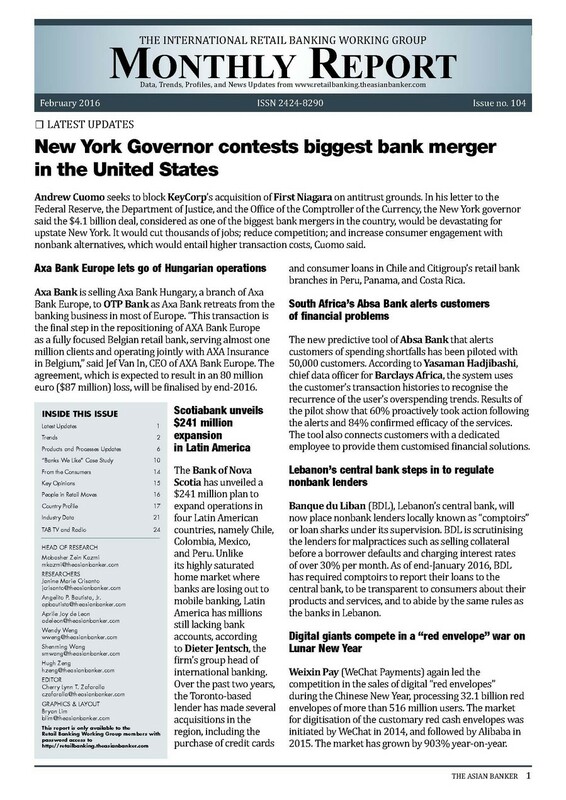 Industry data on digital-only banks, and how they are facing the issues of licensing, scale and profitability. 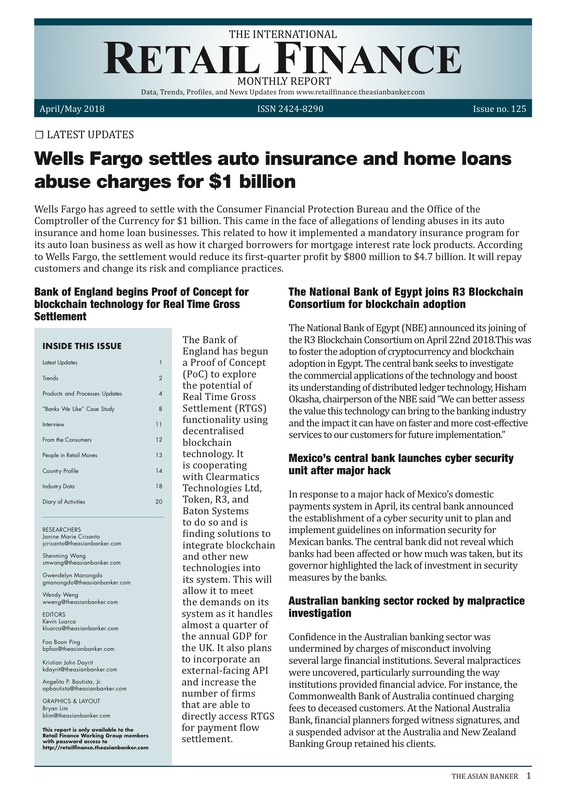 In this issue: In this issue: Trend articles on data and digital as the new success factors in wealth management, and how cryptocurrencies are becoming mainstream. Case studies on how TMB Bank (Thailand) has developed a highly innovative strategy to drive SME revenue. Interviews with Matthias Kröner, founder and chief executive officer of Fidor Bank (Germany) as well as Dilan Rajasingham, head of emerging technology at Commonwealth Bank of Australia. 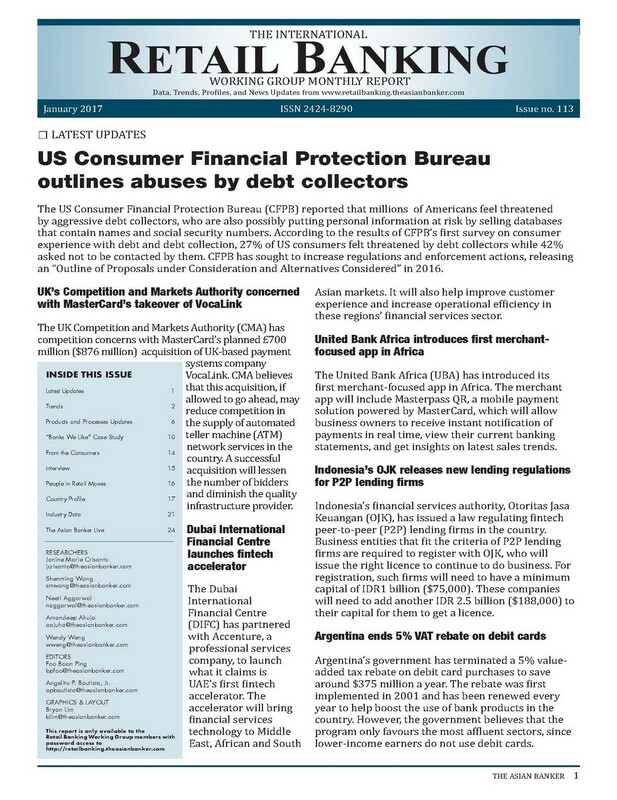 A country profile on Philippine banks and industry data covering the rising household debts in a number of Asia Pacific countries. In this issue: In this issue: A trends article on creating the next level of client engagement with the Internet of Things (IoT). Case studies on how China Merchant Bank and Thanachart Bank (Thailand) leverages on emerging technologies to boost their respective businesses. Consumers' feedback on chatbots. An interview with Renu Satti, chief executive officer of Paytm Payments Bank (India). 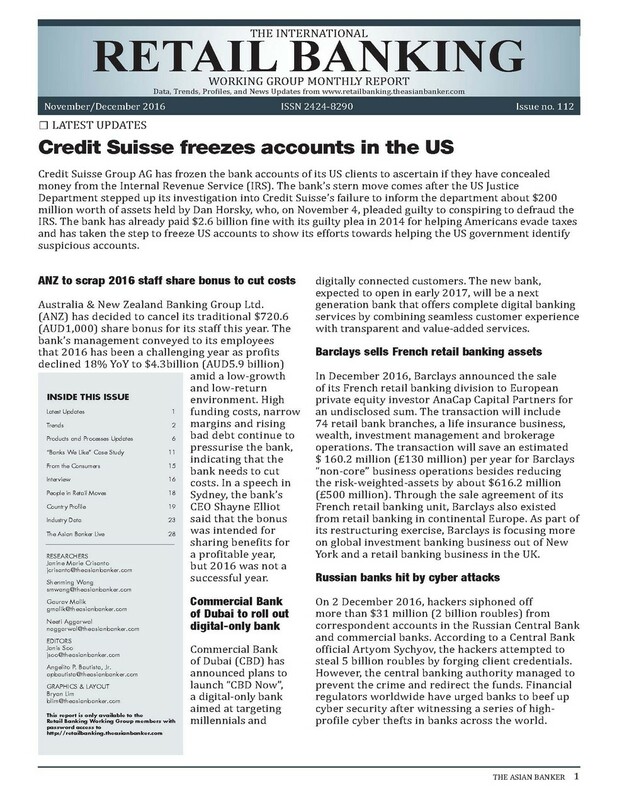 A country profile on Australian banks and industry data covering assets under management in Asia Pacific. 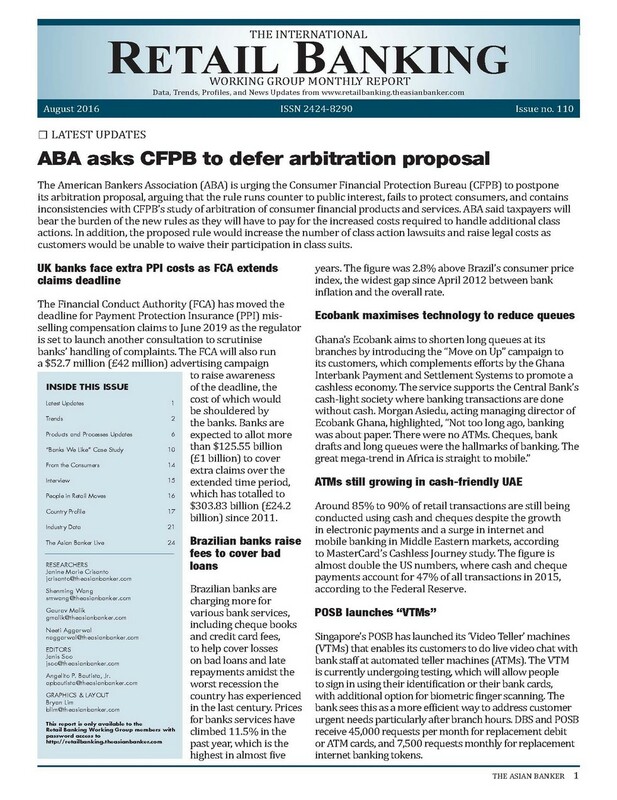 In this issue: In this issue: A trends article on alternative credit scoring models entering the market. A case study on Lendr, a digital platform, pushing for inclusive consumer finance in the Philippines. Consumers' feedback on contactless payments in Asia Pacific. An interview with Jim Lai, head of Tencent Financial’s technology department. A country profile on China banks. An industry data on the Top 100 Retail Banks in Asia Pacific, Middle East and Africa. In this issue: In this issue: A trends article on how QR codes are driving digital payments. A case study on CIMB EVA and how it is changing the face of banking in Malaysia. Consumers' feedback on peer-to-peer lending in Asia Pacific. An interview with Mary Huen, Standard Chartered Bank Hong Kong. 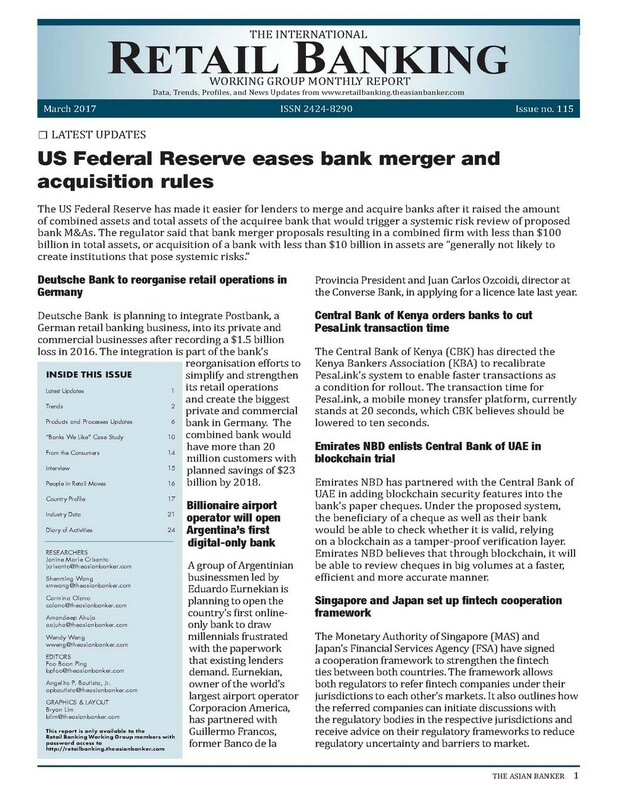 A country profile on Kenyan banks. An industry data on Asia Pacific's retail asset quality. 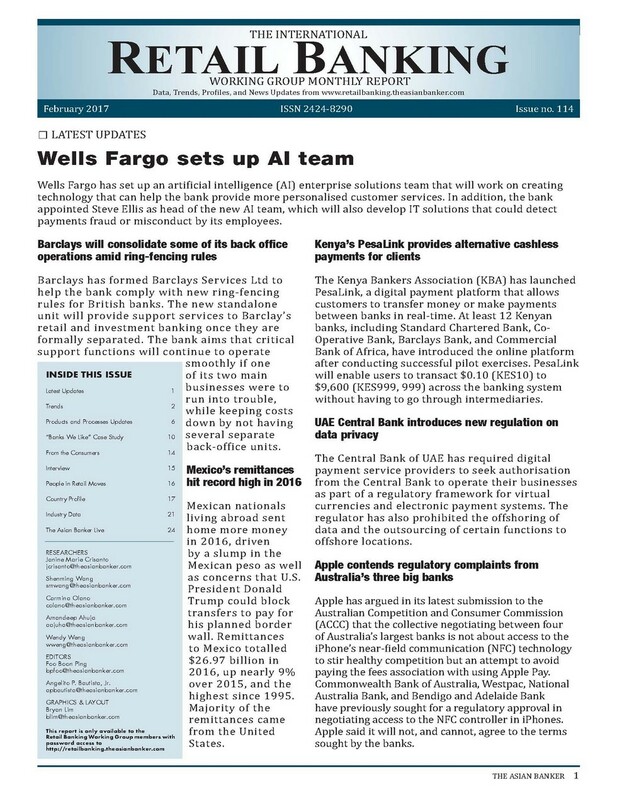 In this issue: In this issue: A trends article on how chatbots are becoming an increasingly popular option for banks in improving customer experience at a low cost. A case study on Firs Bank Nigeria's 'FirstMobile', the fastest growing mobile app service in the Nigerian market in 2016. Consumers' feedback on remittance services. An interview with Samir Gupta, CEO, group consumer banking. A country profile on Vietnamese banks. An industry data on Asia Pacific's unsecured loan market. In this issue: In this issue: A trends article on building a successful mobile wallet. A case study on China Merchants Bank and how it is enhancing operational efficiency and transforming the mortgage experience through its cloud mortgage platform. Consumer’s feedback on personal finance apps. An interview with Anup Bagchi, ICICI’s Head of Retail Banking. A country profile on Hong Kong. An industry data on the varying approaches in restructuring and optimizing banks’ physical channels. 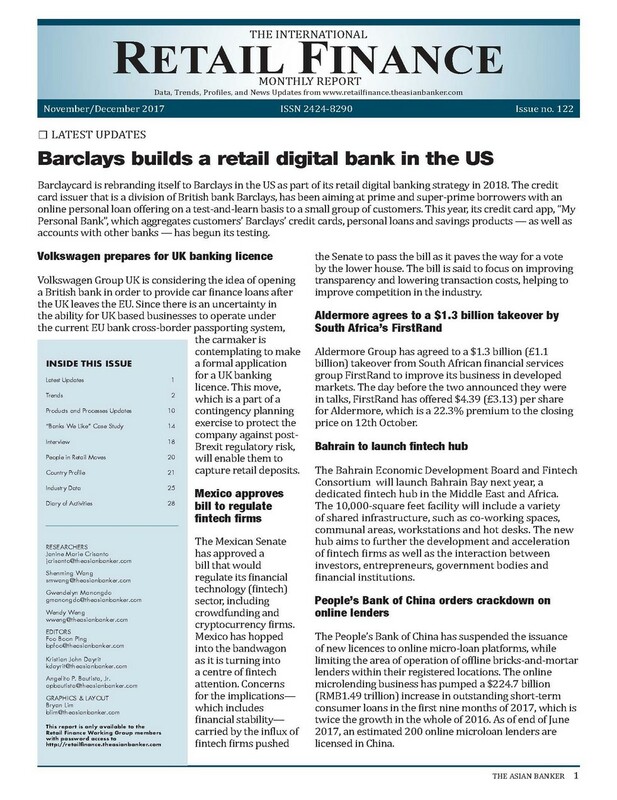 In this issue: In this issue: A trends article on the banks embracing digital innovation. A case study on HDFC’s SM@ Bank and how it is providing SMEs with digital services. Consumer feedback on robo-advisors. Interview with Jeremy Hubbard, head of digital and technology at UBank. A country profile on South Korea as banks invest in financial technology to retain and attract customers. An industry data on the shift of Asia Pacific banks towards digital banking. 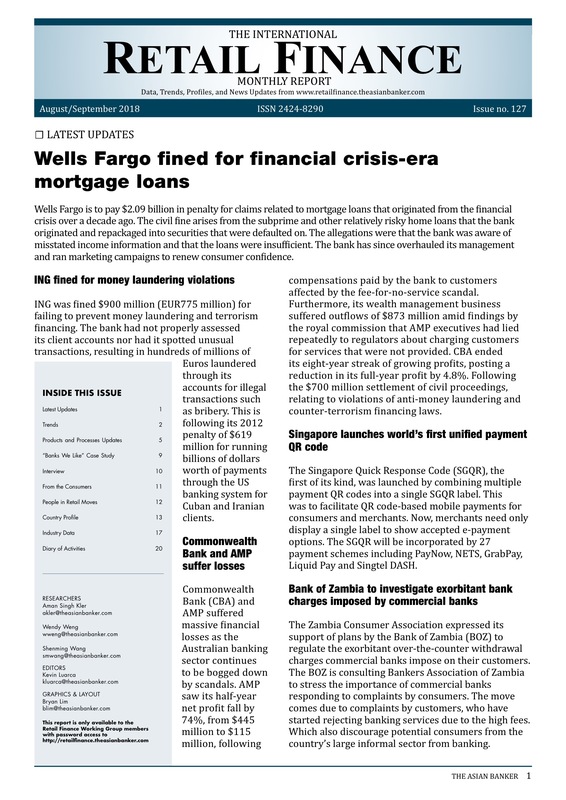 In this issue: In this issue: A trends article on how robots are taking over retail banks' back offices. A case study on Momo and how it is outgrowing banks in the mobile wallet market in Vietnam. Consumer’s feedback on merchant service providers that can facilitate secure customer payments. An interview with Dennis Tan, OCBC’s head of consumer financial services. A country profile on Japan. An industry data on retail banking asset structure in Asia Pacific. 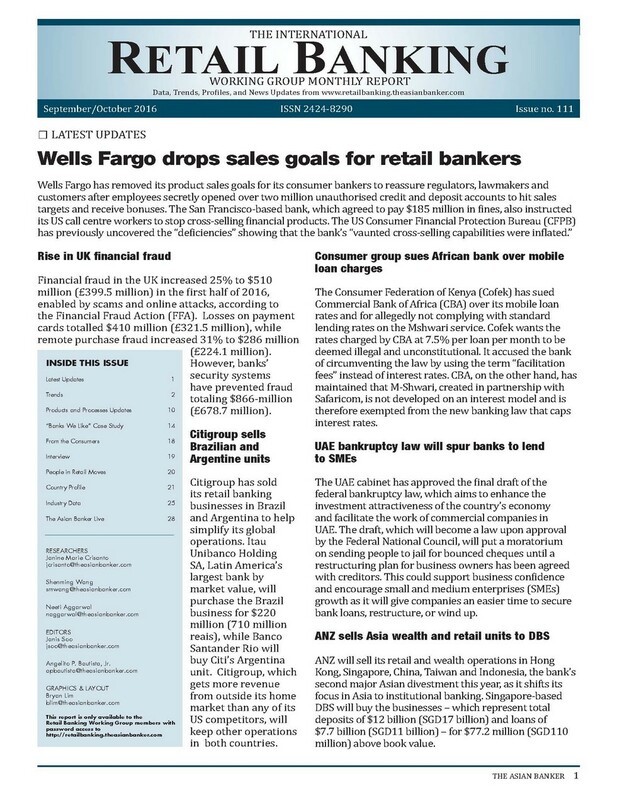 In this issue: In this issue: A trends article on how data analytics is driving retail banking. A case study on PayMaya and how it is targeting the unbanked segment in the Philippines through its mobile app. Consumer’s feedback on money transfer services. An interview with An Hyo Ryul, general manager of retail business development at Shinhan Bank. A country profile on Taiwan. An industry data on auto lending in Southeast Asian emerging markets. 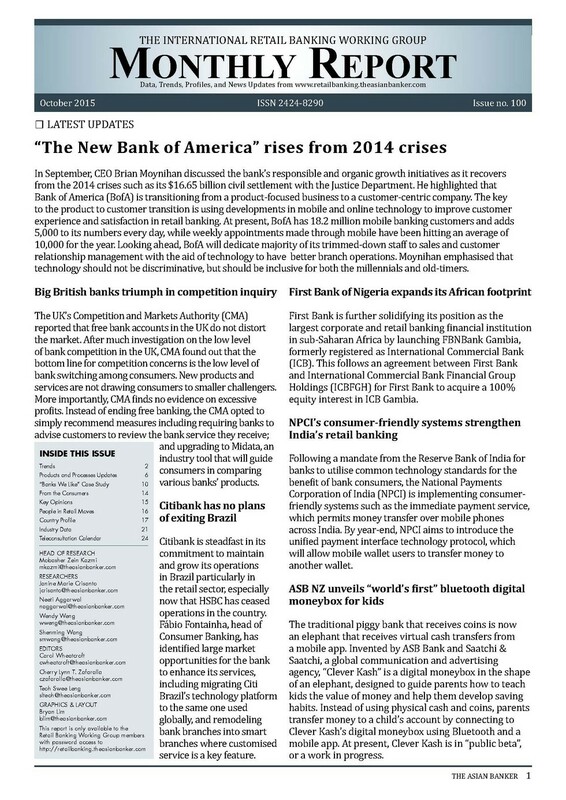 In this issue: In this issue: A trends article in the rise of APIs in retail banking. A case study on Emirates NBD and how it enhances customer experience through its products. Consumer feedback on mobile wallet services. Interview with Petri Nikkila, EVP and head of strategy and segments, Nordea Bank. A country profile on India as it embarks on a digital transformation. An industry data on the outlook for Asia Pacific’s retail financial services industry. 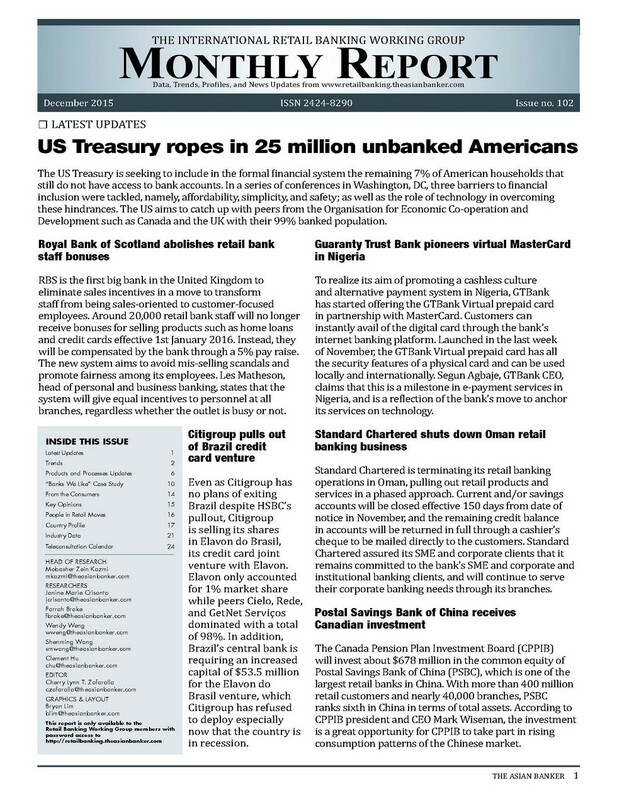 In this issue: In this issue: A trends report on collaboration as a the key to success of P2P lending. A case study on Alipay and its role in transforming China’s mobile payment market. An interview with Tran Hung Huy, chairman, Asia Commercial Bank. Consumers' feedback on bank security. A country profile on UAE’s banks as they feel the pressure of an economic slowdown. An industry data on electronic payments in Asia Pacific. In this issue: In this issue: A trends report on the take-off of robo-advisers in Asia. A trends report on the growth of mobile payments A case study Shinhan Bank’s full service biometric-enabled digital kiosks. An interview with Simon Loong, founder and chief executive of officer of WeLab. Consumers' feedback on consumer financial apps. A country profile on how Malaysia’s market conditions is adversely affecting consumer spending. An industry data on the rapid adoption of digital banking. 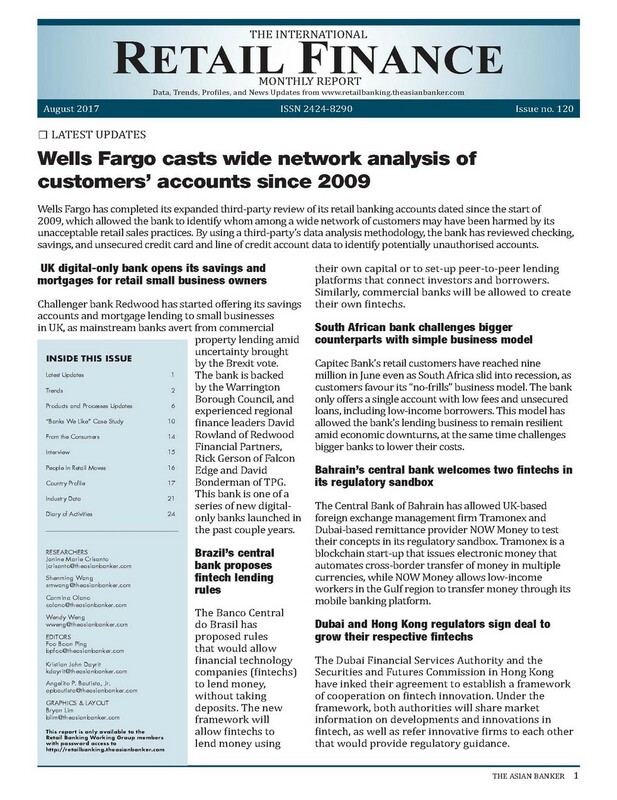 In this issue: In this issue: A trends report on how digital transformation powers profitability in branch banking. A case study how DBS is preparing for a digital future. An interview with Gray Stern, co-founder and chief commercial officer of Landbay. Consumers' feedback on customer service based on BankQuality.com. A country profile on Korean banks and the increasing household debt in the country. An industry data on the relationship between the composition of retail assets and ROA. 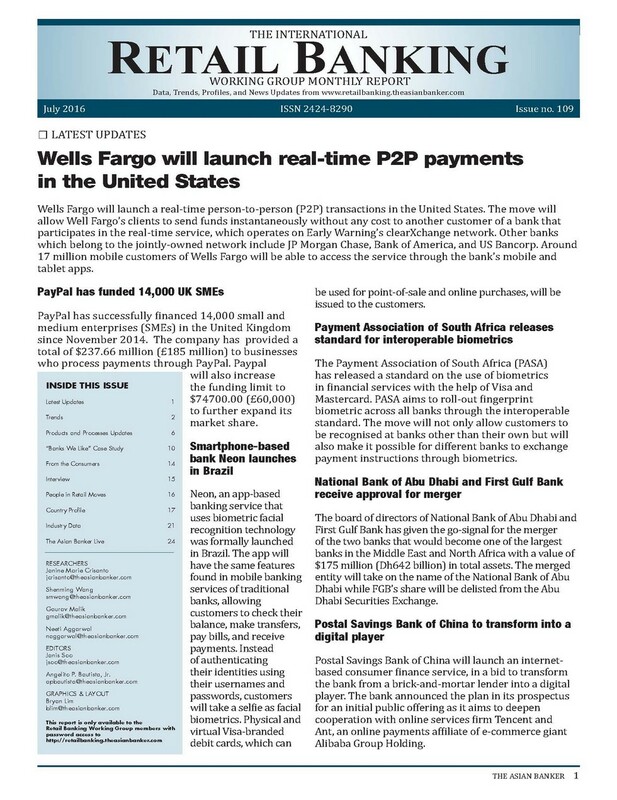 In this issue: In this issue: A trends report on real-time retail payment systems in Asia Pacific. A case study on how Bank of Ayudhya improved customer experience through branch automation. An interview with Cynthia Siantar, co-founder of Call Levels. Consumers feedback on ATMs based on BankQuality.com. A country profile on Thailand banks which are undergoing a digital transformation. An industry data on the varying trends in banks insurance and investment fee income. In this issue: In this issue: A trends report on building digital capabilities to digital transformation. A case study on how WorldRemit is pioneering a mobile-first approach to remittances. Consumers' feedback on banks' loan products and services based on BankQuality.com. A country profile on the continuous rise of consumer credit exposure in the Philippines. An industry data on Indonesia's retail banking sector. 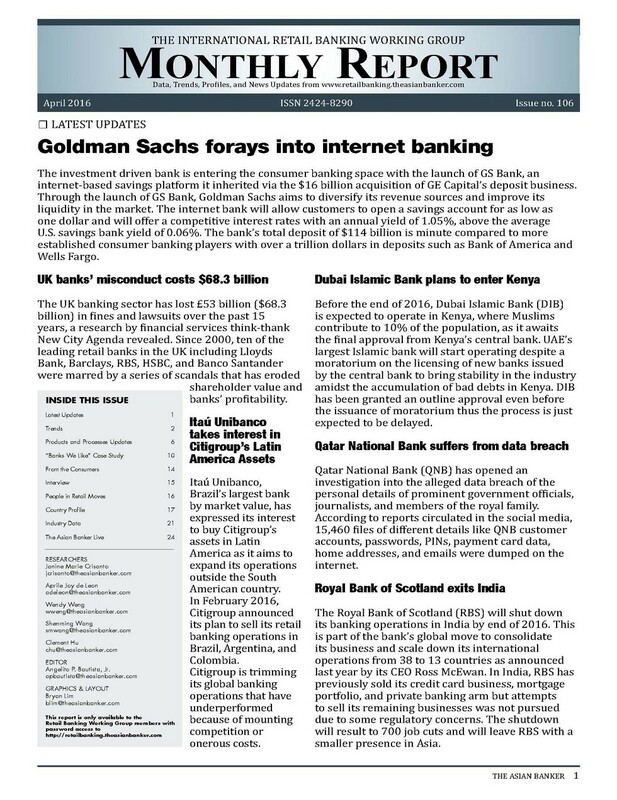 In this issue: In this issue: A trends report on how banks collaborate with fintech. A case study on how Alliance Bank is creating a niche in Malaysia's SME sector. Consumers' feedback on credit card products based on BankQuality.com. A country profile on Chinese banks and how they are finding opportunities in the increasing credit card usage in the country. An industry data on the trends in deposit intermediation in Asia Pacific. 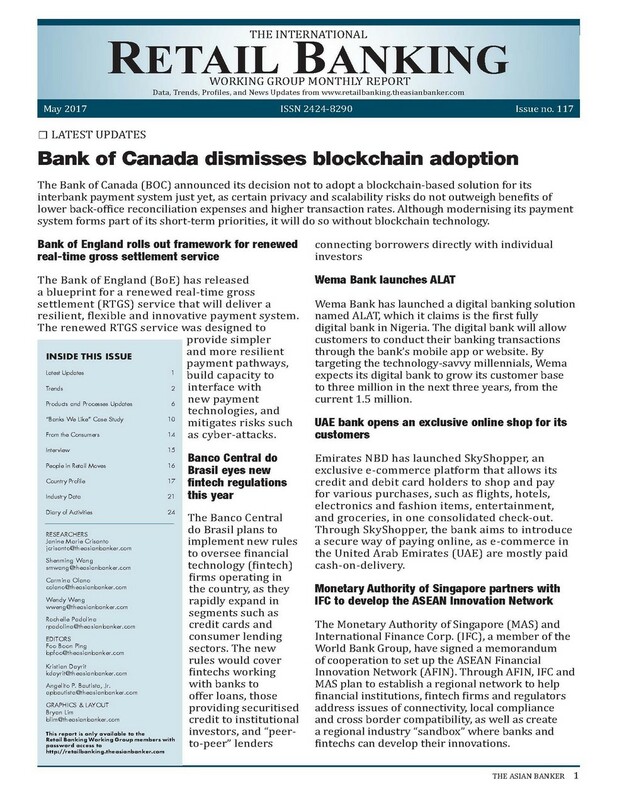 In this issue: In this issue: A trends report on the applications of the blockchain technology in the financial industry; a case study on how Jibun Bank is achieving profitability and growth without a branch network; consumer feedback on bank's onboarding processes; a country profile of Vietnam banks and how technological application is becoming a key success factor; and industry data on the contribution of consumer finance in retail banking. In this issue: In this issue: A trends report on how China is strengthening its payments infrastructure through an integrated retail payment system; a case study on how Standard Chartered Asia Pacific is leading the push in bringing greater flexibility and mobility to its front-line employees; consumer feedback on bank contact centres; profiles on State Bank of India and Axis Bank as they boost retail lending in India; and data on the mortgage industry in Asia Pacific. In this issue: A trends report on how crowdlending is trying to make its mark in the Asia Pacific; a case study on Krung Thai Bank as it seeks to mobilise not just government but private deposits; a country profile on how retail banking is evolving in the United Arab Emirates, and how National Bank of Abu Dhabi and Abu Dhabi Commercial Bank are gearing up to be competitive; and industry data on retail payment trends in the Asia Pacific. 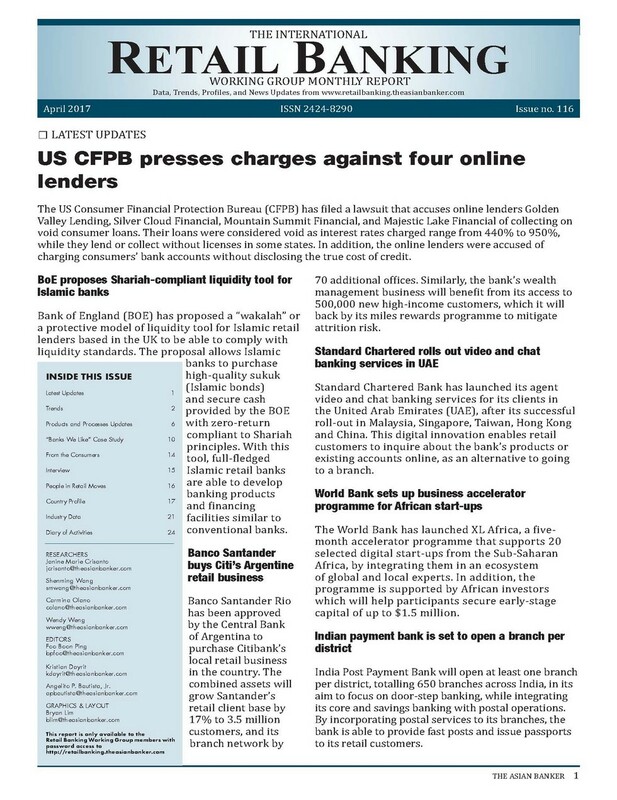 In this issue: In this issue: A trends report on multi-layered solutions for a complete defence against cyber fraud; a case study on Bank Muscat as it enhances customer service and customer satisfaction; a country profile on Hong Kong banks, specifically Bank of East Asia and Hang Seng Bank, as they increase their retail operations under a tighter regulatory regime; and industry data on ATMs and branch networks continuing strong growth in Asia’s emerging markets. 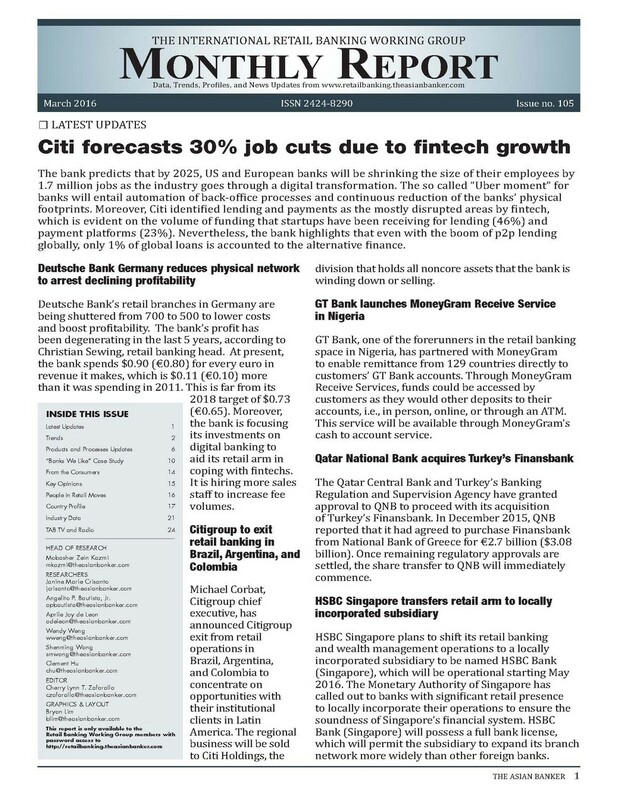 In this issue: In this issue: A trends report on how to make distributed ledger technology work for retail financial services; a case study on Maybank, Malaysia in its search for efficiency; a country profile on Indonesia with focus on Bank Central Asia and Bank Mandiri, as they spur on retail loans and explore digital lending; and industry data on cost-to-income ratios of banks in the Asia Pacific. 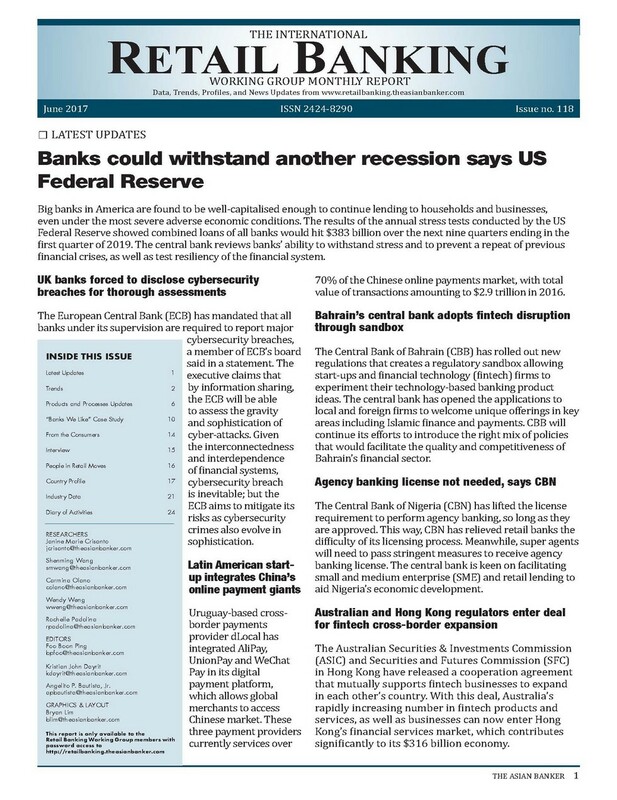 In this issue: In this issue: A trends report on gross income from retail financial services for banks in Asia Pacific, which are seen to expand to $824 billion by 2020; a case study on HDFC Bank, India as it embarks on digital enablement to compete with new entrants; a country profile on Australia with focus on CBA and Westpac, as they ride the wave of digitalisation while anchoring to traditional ATM and branch banking; and industry data on slowing remittances to the Asia Pacific.